Want to be a hero? Want to save a life? All we have to do is donate blood. I know that sounds creepy to some people, but it really is not! And, it may be easier than you think. It takes less than an hour and it doesn’t hurt…that much. If you are interested in helping to save a life visit www.redcrossblood.org. Not only can you find upcoming blood drives, but you can also make an appointment. (That means you won’t even have to wait the day you donate.) If you are unsure about donating look around the Red Cross’s website. It has plenty of information there, but here is a quick list of reasons to donate. Blood is something most people can spare, but there is still not enough to go around. Nobody can ask you to do any heavy lifting as long as you have the bandage on. You can wear it for as long as you like. You will ensure that blood is there when you or someone close to you may need it. 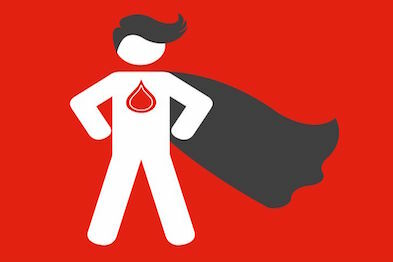 Most people don’t think they’ll ever need blood, but many do. Blood is something money can’t buy. Only something one person can give to another. You may give a newborn, a child, a mother or a father, a brother, or a sister another chance at life. In fact, you may help save up to three lives with just one donation. You will walk a little taller afterwards and you will feel good about yourself.